I’m a great believer in the intelligence of children. I believe they really do know what’s good for them. They know that if something’s funny, it’s appropriate to laugh right then and there. They know that if they have a great idea, they need to share it with the world and not keep it to themselves. 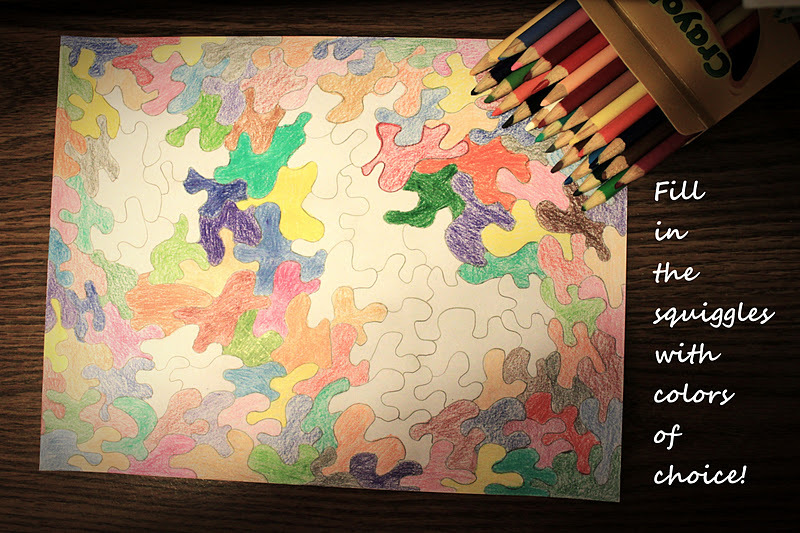 They know that coloring is not just a means for their parents to keep them quiet, but it’s also relaxing, fun, and can provide something light to do while talking. I don’t know about you, but I can’t resist a new box of sharpened colored pencils. 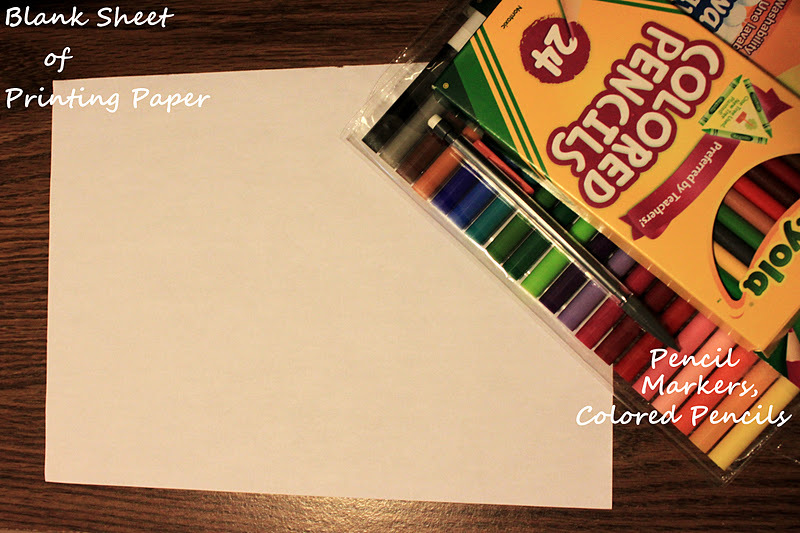 Or a blank sheet of printing paper. Or a set of colored markers. Or sharpies. Or chalk, or a sharpened pencil. In other words if I get my hands on a writing utensil I tend to doodle. When in elementary school I did my first squiggle mosaic. That’s what I call it because I have no idea if it even has a name, we called it “that thing” and would make squiggles in the air when we wanted to describe it. A couple of weekends ago I was coloring one of these on the kitchen table, and Dora asked me what I was doing. I showed her and asked her if she’d like to try. 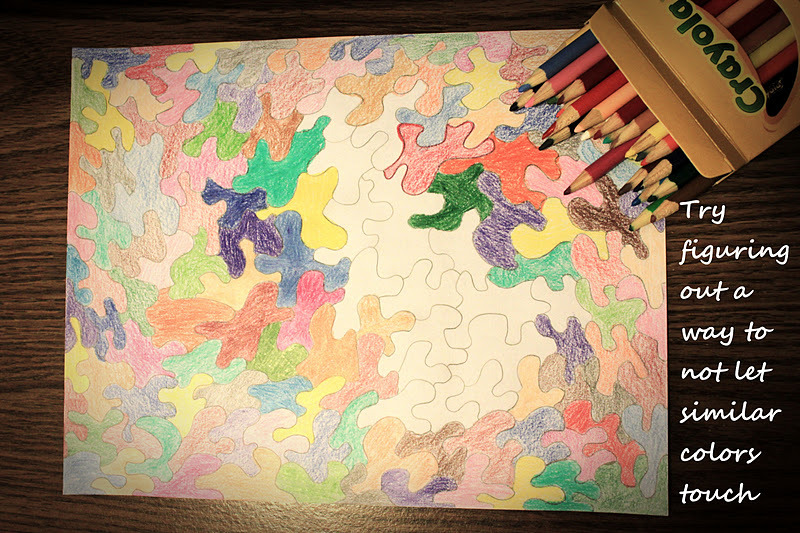 She shrugged, and said she’d color one square. Half an hour later I got my mosaic back with only a few “squiggles” to fill in. “It’s so relaxing and therapeutic!” she told me. If you don’t know how to do this, thou must learn! You might not finish it in one sitting, but it’s fun, and if you live someplace like Abbotsford, you need new activities for all the rainy days. Call your kids, clear the table, get out the “ingredients”, and get started! 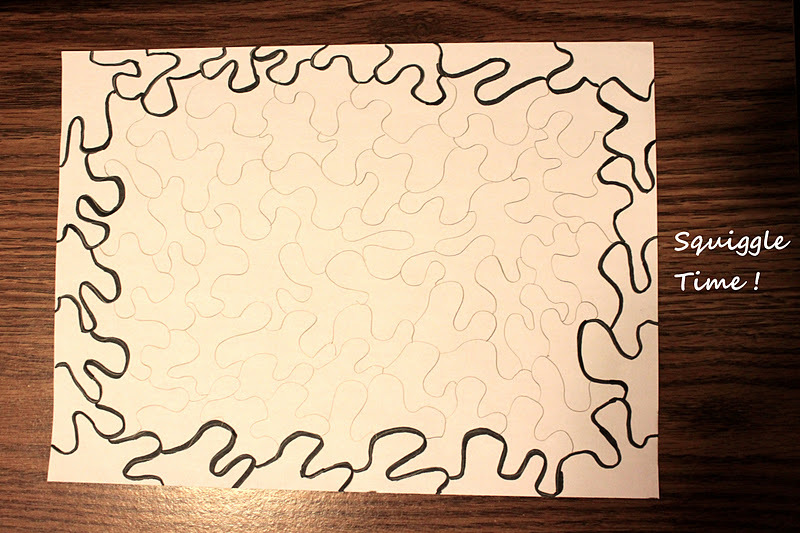 Here’s how to make, what I call, a squiggle mosaic. I used colored pencils for this one, usually I use markers, but this time I wanted it to be different. You can use any coloring utensil you’d like. 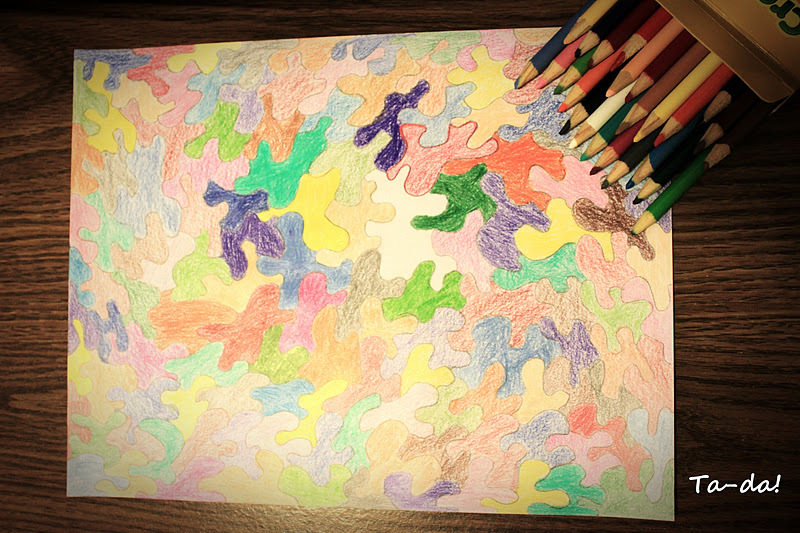 Because I colored in with colored pencils I drew mine in pencil. 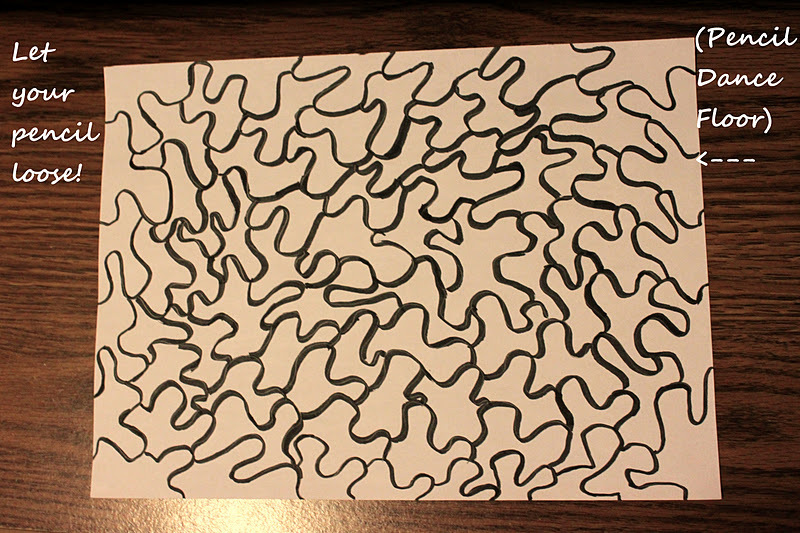 But in order for the squiggles to show up better in the photos I made one with a black felt tip marker. The bigger the squiggles the easier it’ll be. I just draw them at random and let my pencil and hand do their own thing. You can either color it in with all the colors you can get a hold of, or you can make black and white ones, or use two or three colors. Use your creativity. If you are using all the colors in your crayola box, then try to make sure similar colors (different hues/shades) aren’t bordering each other.